From left: Jennifer Hirst, Tony Pegg, Louise Norman, and Liam Rowe. Halifax-based innovator Envirowater has been named as a winner in the Cummins Environmental Gateway corporate acceleration programme for their submission of their Free Flow Waterless Urinal Valve product which is designed and manufactured by Sannitree International in South Africa. Envirowater submitted its idea after Cummins, the largest independent maker of diesel engines and related products in the world, called on innovators of all sizes of all sizes to come forward with market-ready, sustainable innovations to help Cummins achieve their Environmental targets in the UK. Launched in September 2016, the Cummins Environmental Gateway attracted more than 100 submissions in just 40 days. The ideas came from innovators, small businesses (SMEs) as well as corporates around Britain and the world. Envirowater is the business behind the Free Flow Valve. They offer water free solutions for businesses wishing to drastically reduce water consumption and save money by converting standard urinals to water free. 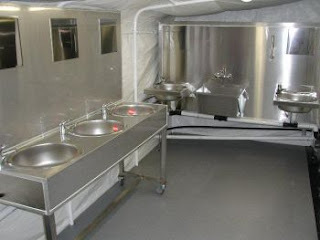 It’s completely chemical free, easy-to-clean, simple to fit with no on-going maintenance. There’s no smell, bacteria or blockages. Denis Ford, International Sourcing Leader EMEA, NE/SE Asia & S. Pacific at Cummins said: “We would like to congratulate Envirowater for making the Cummins Environmental Gateway Successful Innovators List 2017. We have been very impressed with the quality of Envirowater’s innovation, and even more with the potential for environmental impact and savings. Together we can do more for innovation and environment”. The Cummins Environmental Gateway, a first of its kind for Cummins globally, was launched in September 2016, in partnership with Marcela Navarro, CEO of Business Cubed (formerly responsible for the successful design and deployment of the RBS Innovation Gateway). Unlike other corporate innovation programmes, the Cummins Environmental Gateway focuses on the adoption of sustainable innovations rather than on the ideation process, providing innovators with real opportunities to test their innovation in real life environment, accelerating their access to market and their opportunity to scale up. Marcela Navarro, CEO Business Cubed, said: “With so many high impact solutions failing to reach the market due to perceptions of high risk and costs, genuine industry-level sustainable innovations are not able to scale up. The quality and the range of ideas selected as successful innovations, like Envirowater has been phenomenal. 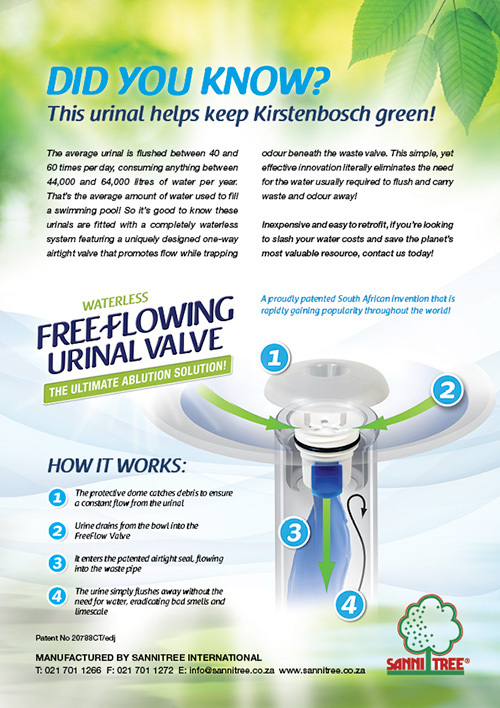 Read more about Sannitree’s FreeFlowing Waterless Urinal Valve or contact us on +27 21 701 1266 for more information. Posted in Industrial & Municipal, Water Saving & Recycling | Tagged waterless urinal valves, waterless urinals. A Yorkshire-based innovator has been listed as a finalist in a global search as part of a business’s project to improve sustainability. Halifax-based Envirowater have been successful in the project by Cummins known as the Environmental Gateway. Envirowater submitted their ingenious idea after Cummins, the largest independent maker of diesel engines and related products in the world, called on innovators of all sizes to come forward with sustainable innovations to help Cummins achieve their Environmental targets in the UK. The Cummins Environmental Gateway, launched in partnership with Marcela Navarro, CEO of Business Cubed (formerly responsible for the successful launch and deployment of the RBS Innovation Gateway), is looking for green and innovative suppliers to positively impact Cummins 2020 Environmental targets whilst promoting supplier inclusion. The project team, led by Denis Ford, Corporate Indirect Purchasing Leader EMEA, NE/SE Asia & South Pacific at Cummins, is delighted with the quality of the finalists. “We have been very impressed with the quality of the innovations received and even more with the potential for environmental impact and savings. Envirowater should be very proud to be a finalist in the Cummins Environmental Gateway”. Envirowater was one of more than 100 companies from across the globe that submitted an innovation to the Cummins Environmental Gateway when Cummins UK launched the programme back in August 2016. Envirowater’s idea will be presented on March 2, to a high calibre panel from Cummins who will decide which innovations will have the opportunity to be implemented, and if successful, scaled up, on Cummins sites in the UK. “Projects like the Cummins Environmental Gateway provide a great opportunity for innovations to gain recognition and credibility on a national and international scale, accelerating our opportunities to access markets and scale. Finalists like Envirowater, if successful, will have the opportunity to test their innovations in Cummins sites in the UK. Issued on behalf of Envirowater by Ellie MacDonald of MacComms. For more information contact 07989159138 / ellie@maccomms.net. Posted in Water Saving & Recycling | Tagged water saving, waterless urinal valves, waterless urinals. What a Testimonial! Read what the Arizona State University has to say about our revolutionary no-smell waterless urinal valves! Greetings from a hot wet and humid desert town! They are PERFECT! No more smell!! I never got used to that blue seal chemical odor that comes with the Waterless brand urinals. Always the chemical or chemical and urine smell. Now there’s just NO smell with the Free-flowing Waterless Urinal Valve. They are wonderful and we couldn’t be happier! We’ll be in touch for more product soon. I trust you are fit and well. You have had our free-flowing waterless urinal valves for slightly over 3 months and I thought I would check to find out your level of satisfaction? Posted in Odour Removal, Water Saving & Recycling. South Africa probing socially acceptable low- and no-water sanitation alternatives. WAMTechnology are specialists in implementing technology systems for improved governance, focussing on Water and Public Health Information Systems. Posted in Fly Control, Water Saving & Recycling. The vital part of this article is the 40% shortfall of potable water in 15 years time. Mike Mayne of Sanitree remains confident that there WILL BE water millionaires in the near future for those with foresight and have some entrepreneurship ability. “Those who see it now will make it, while those that don’t will be too late” says Mike, referring to this article featured in The Water Wheel in April 2015. Remember opportunities are like milestones you pass them without seeing them ! As drought in South Africa becomes a reality, many small boutique hotels and farms which are off the sewage grid are looking to modular sewage treatment systems capable of re-cycling the grey water that passes through them. The toilet to tap system you can install yourself! Sannitree® have developed a compact bio-reactor that is electrically efficient and uses a biological operating principle to render the waste stream DWAF compliant. This means that the final effluent is suitable for irrigation as determined in the National Water Act 1998. This toilet to tap system can treat 5 to 20 cubes of waste per day and due to its modular add-on capacity, the system can be expanded as demand increases. Because it requires so little space it can be easily hidden. Unique amongst its competitors, the Super Sewer System allows the customer to install the bio-reactor themselves, if they so wish. The entire fibre-glass tank system can be nested within each other and will easily fit on the back of a small truck. The installation process is not difficult and offers a significant cost saving. The Super Sewer is a proven system and has been around since 1998. In keeping with their ISO Accreditation, Sannitree® regularly test the quality of waste effluent through independent laboratories. While Sannitree® do not claim to polish effluent water to clarity good enough to mix with your favourite whiskey, they offer a fantastic waste stream perfect for use in agriculture or landscaping. 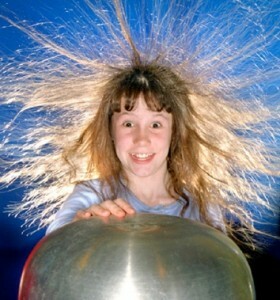 If your property is ‘off the sewage grid’ call Sannitree® now, they have the technology to help. Their driving maxim has always been to judge water on its quality, not its family tree. It may have been down the toilet a few times, into a septic tank and through a Super Sewer, but they guarantee that it is still good for a couple more flushes. 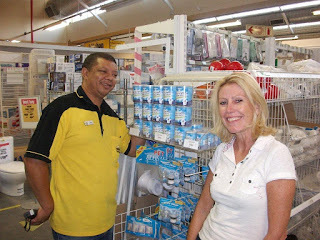 For more information on our Super Sewer call us now on +27 (0)21 701 1266 or visit our website now. 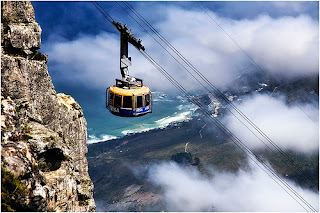 Table Mountain National Park is one of Cape Town’s busiest tourist attractions, receiving on average 15 000 visitors per day. This equates to a lot of toilet waste for an area without a sewage system! What this means is that all their sewage is transported daily, first class, via the famous cable way car so it can be safely disposed of. But Sannitree have alleviated part of this problem by installing Free Flo Urinal Valves, which eliminates the need for water or flushing. The overall effect is a huge reduction in sewage waste, a cash saving, and a lowering of the environmental footprint of the visitors, because you don’t need water to transport water. Plus it cut out odour problems. 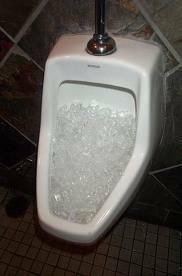 Ever seen a urinal packed with ice? That’s because they are probably water borne urinals and inclined to block, causing smell problems. Free Flo Urinal Valves create a dry surface environment, which does not allow bacteria to breed and spread bad odours. The Cape Town Science Centre is a wildly popular interactive science centre aimed at the youth market with up to 138 000 visitors per year. With their move to Observatory, a new addition to the facility is an outdoor area, where visitors can learn how they are harvesting rain to save water… or simply to enjoy a game of Giant Chess! It is fitting that the Science Centre takes it water saving seriously as they have now installed Free Flo Urinal Valves to all the men’s urinals, as the cash saving is considerable when you factor in that around half of the visitors are male, and on average the saving is 3-5 litres per flush. 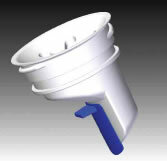 The Freeflow valve eliminates the need for water flushing and stops bad odours so common in men’s urinals. In addition it is retro-fitted into most urinals (task time 3 minutes), and maintenance costs are extremely low. Posted in Resellers & Distributors, Water Saving & Recycling. To predict that South Africa will run out of drinkable water in a year’s time sounds wonderfully surreal, but it isn’t as far-fetched as it might seem. Southern Africa has already run out of water. In many regions our city planners already have had to put alternative measures in place. Municipalities that have already set about implememting technolgy such as desalination plants or effluent treatement systems should be commended for doing so. Those who still fighting the general assumption that it is too costly for both the consumer and the local authority to implement should stop dawdling and start running through a few worst-case scenarios. Just ask the municipality of the Karoo town such as Beaufort West what it feels like when your local storage dams dries out because of drought. 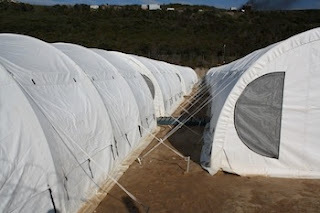 We believe that it is only once more people have experienced first hand what it feels like to be rationed to the number of times you are to flush your toilet in a week or the quantity of water you can drink, that the message of saving and planning for imminent water shortages will start to sink in. If those in the know were not worrried about our water situation, there would have been no need to form the Stellenbosch University Water Institution to look into issues such as water provision, water management and a sustainable environment. It would have not been neccessary to have established a similar venture, the Water Research Commision. For that matter, there would have not been for Sannitree International to look into issues such as waste water treatment, ownership and ways of conserving water. It a fact that water has an influence on our economic development and growth. It is a fact that South africa, at all levels need to act now to play their part n safe-guarding or precious water. In most South African cities, the biggest water users, wasters and polluters are breweries, hospitals, university campuses and business parks. When planning and building news ones, it should become non-negotiable that more efficient water usage practices form part of the exercise. We need more waterless toilet in our new housing develpoments. We need decentralised water treatement systems in new office parks. We need to recycle our water more. We need to indigenous gardens to flourish. For that matter, Sannitree International has introduced the free flowing waterless urinal valve. The new valve is a breakthrough invention because it not only drastically reduces the use and cost of water but it also far more hygienic that conventioanl systems. 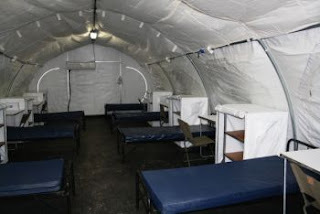 It is a completely waterless system, simple retro-fit, air-tightseal and deoderising dome to keep ablution facilities completely odourless and easy to clean. We need to use water sparingly. We need to treat it as a priceless, commodity that it is. If we do not take care of our water now, it will come at too costly price for us. And next year might simply come to soon.